Arriving from Gordes : take the direction of Roussillon. 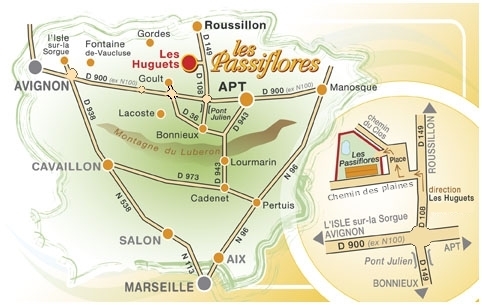 Completely cross the village of Roussillon by Avenue Dame Sirmonde, Rue de la Fontaine and Avenue de la Burlière, then take the route du Pont Julien (Departmental road 149) towards Bonnieux, the Pont Julien, the parking lot St Joseph, then continue on the RD 108 Les huguets. Enter the hamlet on the right. Arriving from Apt : take the direction of Avignon on the departmental road 900, not the direction of Roussillon. Continue for about 8 km, until the roundabout point of the Pont Julien, and turn right towards Roussillon and the hamlet of Les Huguets on the RD 108. Continue for about 1 km, then turn left towards the hamlet of Les Huguets. At the entrance of Les Huguets drive 50 meters then turn right on the square, cross it, the house is just at the start of the Chemin du Clos. You can upload the access map . For any inquiries, or for a reservation, please contact us at the address below.